One thing you will also learn about me as this blog progresses is that among my various food obsessions, I have a certain passion for hot wings. Now this will probably degrade your opinion of my culinary expertise, but are you really going to tell me that hot wings do not taste good? I'm not here to talk about what restaurant has the most trendy dishes or adheres closest to the most current food philosophy. I'm here to talk about food that tastes good. And hot wings just happen to be one of those things (usually). They recently opened, and to keep up our pizza fanatic title, we knew we had to check out Two Jack's on Center. The overall service was decent for a smallish pizza joint (though the cashier was really confused when I asked for fresh tomatoes on my pizza instead of cooked..."Oh, you mean uncooked?" Yes...) but we were a little disappointed in the number of options. Pretty much all of the pizzas are design-your-own, and they don't have any fun flavor combinations for you to try. The only two "specials" are just pizzas with different sauce -- one BBQ and one alfredo, both with just chicken and mozzarella. Not that special if you ask me. Even though it looked like there were only two people in the kitchen, our food came pretty quickly and was hot. 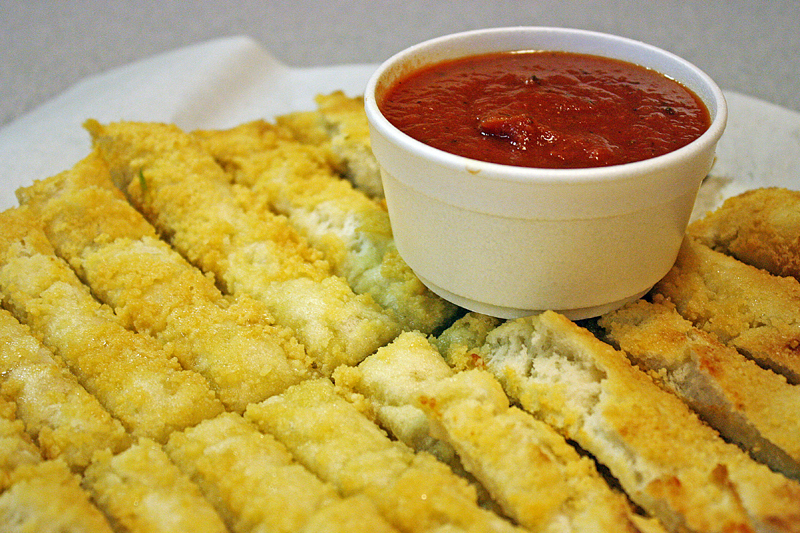 The cheesesticks were delectable, but can you really go wrong with cheese, bread and garlic? I don't think so. My pizza, with the sausage and tomato was decent. The marinara sauce was richly flavored and well balanced by the cheese. I think the only reason I sort of enjoyed the one piece I was able to eat was because I just picked a good topping combination. Owen on the other hand was much more disappointed. The good news was that they put plenty of pineapple on...the bad news was that it just didn't tasted that great. Meh meh meh all around. I really hoped that the wings would make up for it, just like they did at Nicolitalia's for me, but when we got them, all I could think was, "Wow. Dry." They tasted better than they look, but were very much fried, pretty heavy, and lacking exciting sauce. What You Should Do: Go if you have to. The pizza was only mediocre, but if you get invited to go there on an awkward date or something, you won't have to worry about hair in your food or throwing up mid-meal or anything. Probably. The only thing that was remotely interesting about this pizza joint was the other restaurant guests. Yes that guy is wearing a raccoon tail. There was like a whole...clan of them. The only memorable feature about this place.